You can convert documents from Word versions 2003, 2007, and 2013 into DAISY Digital Talking Book (DTB) format by using the Save As Daisy add-in for Word. 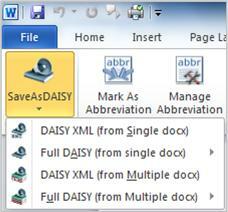 Save As Daisy is not yet available for Office 365 and Word 2016. The add-in is an Open XML to DAISY XML translator. Daisy makes documents even more accessible for people who have visual disabilities. After you install this add-in, you can save Word documents that are in Open XML format as DAISY XML, so they can be converted into the DAISY D.B. format. Before you install the add-in, close all Office applications. Tab to the Download DaisyInstaller x86.exe button. To open it, press Enter. To run the installer, in the Do you want to run or save DaisyInstaller_86.exe... ? frame, press Alt+R. To install the add-in, follow the installation instructions. The DAISY installer opens Word and displays instructions for getting started. The focus is at the beginning of the document. Before you can listen to the content you created, you need to install a free software playback tool (or software reader). There are several available for download on the DAISY web site: DAISY Software playback tools. 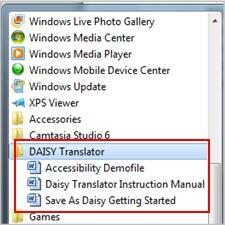 After you have installed the Office XML to DAISY XML Translator add-in, an Accessibility tab is added to the ribbon. On the Accessibility tab, in the Save as Daisy group, click Save as Daisy. Point to Full DAISY(from single docx), and then click Narrator-DtBookToDaisy. Give your work a title, choose where you want to save the finished files, and then click Translate. Additional information about DAISY XML Translator, as well as a complete Instruction Guide, can be found at the DAISY Consortium web site.